LNA-aligned Tariq Ben Zeyad Brigade forces heading south towards Taminhent airbase last week (Photo: Social Media). Ahmed Al-Mismari, official spokesperson for the Khalifa Hafter-led Libyan National Army (LNA), announced the death of AQIM-affiliate, Abduelminam Al-Hassnawi (aka Abu Tallha Al-Libi), Al-Mahdi Rajab Dungo (alleged IS Minister of Defence) and an Egyptian called Abdullah Al-Dusouki in an LNA raid Friday morning northwest of Sebha. The deaths have not been independently corroborated. Some media reports have already refuted that Al-Hassnawi was one of the “terrorists” killed in the LNA raid. There were also brief clashes reported Friday in Sebha, between local LNA units and rival militias, but no deaths or casualties were reported. 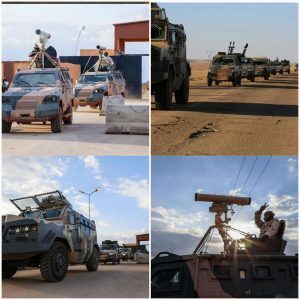 We have started a full scale military operation in the South-West of Libya, LNA spokesperson Al-Mismari announced last Tuesday. The LNA pledged to “secure the southwest from terrorist elements of Al-Qaeda, ISIS and rogue bandits involved in kidnapping, extortion and smuggling and threaten to change the topography of southern Libya”. They also promised to ”Secure key-strategic oil and gas installations, Man-made river (MMR) stations and ensure deliverance of services, fuel and gas to citizens”. The LNA mobilized several units to the southwest, including the Tariq Ben Zeyad battalion arrived at Taminhent airbase (30 Kilometres) north of Fezzan’s capital Sebha last Sunday spending a night in Jufra on Saturday. Other local LNA units were re-mobilized to Taminhent Airbase which the 166th infantry brigade and the 177th brigade reportedly abandoned in December. Several key military barracks and checkpoints, including Sebha’s civil airport remain under control of local community-based militias and negotiations are now ongoing to be handed over to newly-arrived LNA units. Retracing the conflict over 2018, Sebha had witnessed four months of deadly communal clashes from January to May between the Tebus and Awlad Sulieman tribe, which had resulted in loss of life, including many civilians, and the large destruction of state and private property. On first January this year, a fierce fight erupted in the Agriculture Circuits near Ghadduwah village (65 Kilometres) southeast Sebha between the LNA’s 10th Infantry Brigade and the predominantly a Salafist Khalid Bin Walid brigade against a Chadian armed militia which resulted in three deaths and several casualties. Another Chadian armed group was aallegedly responsible for the attack on Traghen’s 10th Infantry Brigade (140 Kilometres south of Sebha and 45 Kilometres east of Murzuq) on 27 December. It resulted in at least one dead and the confiscation of up to 34 armed vehicles from the 10th Infantry’s barracks. It is also worth recalling that the LNA managed to free 22 civilian hostages held in containers by the Chadian militia in the Agriculture Circuits. Initially, it was though they were kidnapped by ISIS in separate incidents at Tazerbu on 24 November and al-Fugha on 29 October last year. ISIS-affiliated social media accounts had claimed responsibility for the kidnappings at the time. The LNA also repelled an attack on Taminhent Airbase on 1 June 2018 which it attributed to a joint Benghazi Defense Brigades (BDB/Saraya) Chadian attack. Last Sunday, SRSG and head of the United Nations Support Mission in Libya (UNSMIL) Ghassan Salame, visited Sebha for the first time since he was appointed on 22 June 2017. He met with representatives from Fezzan’s municipalities, communities, dignitaries and academics where he revealed UNSMIL had created committee on first the of January ”Special Committee for the South”. Although, the LNA had previously announced similar military operations in the south, this one seems to be on a more serious scale. The fact that now the LNA can divert forces from Derna may be a factor. It will also be recalled that the LNA had launched its military operation ”Law Enforcement” in March 2018, during which several airstrikes were conducted against foreign armed groups in the south, but it did not involve such a large ground operation as this month’s. Last Saturday, there were conflicting reports on social media on clashes between the Chadian Conseil de Commandement Militaire Pour le Salut de la Republique (CCMSR) armed opposition group and the Darfuri Sudanese Liberation Army/Minni Minawi (SLA/MM) armed opposition militia. They were reported about 245 kilometres southeast of the border town of Gatroun, near the Kouri gold mining site. This clash was seen as part of a potentially wider conflict on Libyan soil of foreign armed groups affiliated with Libyan factions. The LNA-aligned SLA/MM had been previously stationed in the Jufra region since early 2016. CCMSR-affiliated social media accounts denounced the SLA/MM incursion and accused the LNA of being complicit with the Chadian regime in undermining their struggle in liberating the Chadian people. On the diplonatic front, Italy’s prime minister, Giuseppe Conte, paid a visit to the capitals of Libya’s southern neighbours, Niamey and N’Djamena on Tuesday and Wednesday. He met with presidents, Idriss Deby and Mohamadou Issoufou and discussed several issues, including stability in southern Libyan, migration, counter-extremism and rehabilitation of border security and surveillance capacity-building.